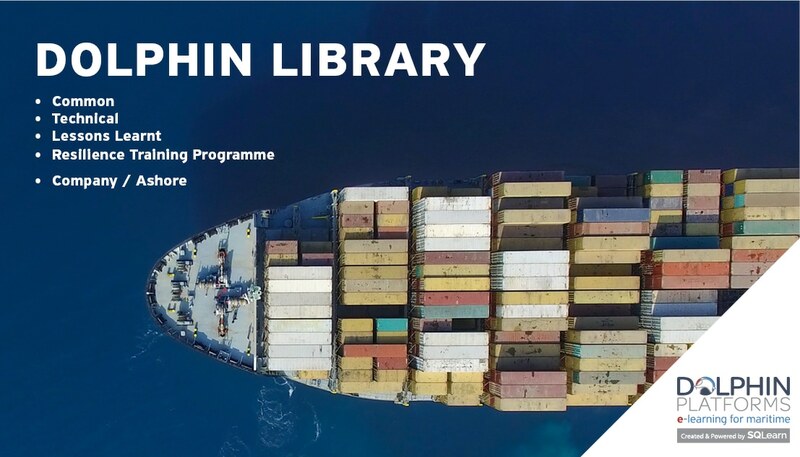 SQLearn designed a library of interactive e-learning courses that covers the training needs of the shipping companies and provides a modern way to improve safety for maritime. The e- learning courses are based on STCW topics that cover national, international and flag requirements. The e- learning library includes categories of various topics, such as “Common”, “Technical” and e- learning modules about the “Resilience Training Programme”. Moreover, the “Lessons Learnt” e-learning courses are based on incident reports and give users a detailed description of an incident using 3D video animation techniques. The goal is to help users understand the root cause of an incident and prevent similar incidents from occurring. Apart from the e- courses that are addressed to seafarers, there are also available courses for the personnel ashore. E-learning courses are offered with an innovative hardware solution for onboard training called Dolphin Box. Using Dolphin Box the crew manager can manage and monitor the training process across the fleet in real time while all seafarer trainings (e-learning, ashore trainings, drills) are kept in a complete seafarer training record. SQLearn is also certified for providing e-learning services according to ISO 9001:2015 from TÜV Austria Hellas.